Former Packers WR and dancing champion Donald Driver will return to the ABC show “Dancing With The Stars” on Tuesday night, along with a number of other former NFL players who have competed on the show, as part of the “DWTS” 10th anniversary special. Driver won Season 14 of “DWTS” with dance partner Peta Murgatroyd back in 2012. He is slated to appear on the 10th anniversary special along with NFL greats Hines Ward, Kurt Warner, Jacoby Jones, Emmitt Smith, Michael Irvin and Jerry Rice. The show airs at 7 p.m. CT Tuesday. There’s a new title for Titletown thanks to Green Bay Packers WR Donald Driver, Peta Murgatroyd and the fans that voted for the duo on “Dancing with the Stars.” Driver has won the Season 14 mirror ball trophy after 10 weeks of competition and over 12 styles of dances. The Cha-Cha-Cha proved to be the final dance and his second perfect score of the season for Driver who last showcased the Latin American dance back in Week 1 of the series. Scoring a perfect 30 with this final dance, the judges did not throw any penalty flags. Or any penalty flags to any of the finalists for that matter. All remaining couples had perfect scores on their final dance. Which meant it was up to the fan votes. The votes that would send Driver home with the mirror ball trophy. “The public will decide,” said Judge Bruno Tonioli in the opening segment of the final episode. Perhaps Tonioli had a revelation of how the show would end. Or, perhaps, he knew about Packers fans and how they support their team both on and off the field. Regardless, fans are the likely factor that held back the 2nd place duo of Katherine Jenkins and Mark Ballas. A singer, actor and wide receiver were the last three standing just a night before with one point between all three pairs. Jenkins and partner Ballas came into tonight’s competition as the leaders with the perfect score of 60 points, while Driver and Murgatroyd tied with William Levy and Cheryl Burke with 59 of 60 points. Perfect scores for all three final dances kept Jenkins on top with 90 points while Driver and Levy remained tied for second place with 89. But that’s before the fan votes were tallied in the evening’s final total. The first of the three couples to be relieved for the night was Cuban-born Levy (known jokingly by Tonioli as the “Latin-dancing James Bond”) and then the news came fast that Driver was the season’s champion. In counting collective perfect scores during the season, Levy was the leader with four, followed by three from Jenkins, two of which were earned the night before, and Driver with two perfect scores in the past two days. Keeping a steady pace for the entire season, Driver rarely was in first place, but always near the top third or within a fraction of points on the “DWTS” leader board. It was a slow and steady climb for the trophy, almost in a “Most Improved Player” style arrangement. Taking criticism and learning from it, keen choreography upgrades and the absolute will to win was enough to have the judges in favor of a perfect score that Driver and Murgatroyd needed for their last score, coupled with the fan votes to take the trophy home. Undoubtedly Driver landing first place for the season, out of an original 12 couples, was not shocking for the Packers fans that voted. Tomorrow the mirror ball trophy will kick off the TV circuit tour with morning shows and hopefully find its way to Titletown. Click here to see photos from Driver’s victory. Each couple showcased two dances for the evening, one being Freestyle (a dance of their choosing with creative latitude) and the other being a standard ballroom dance. Driver’s country-inspired Freestyle combined his Texas roots (outfitted in a green and gold Western ensemble with a cowboy hat) with pure athleticism. His dance showcased his dexterity, coordination and stamina, particularly with the lifts required in this performance. After Driver’s last dance, also the last dance of the evening, it was tough to discontinue the enthused crowd from clapping. Judge Carrie Ann Inaba rewarded Donald and Peta with a personal standing ovation. “It was my favorite dance tonight,” Inaba said. At that point, all knew Len would be giving Donald and Peta their first 10 of the series and their first perfect score. Prior to the evening, each of the judges each visited one of the remaining couples: Driver, Cuban-born actor William Levy and Welsh opera star Katherine Jenkins during weekly practices. Driver handled it similarly to that of one of his on-field coaches when Inaba came for a visit to inspect his Argentine Tango. She expected bigger, dynamic movements from Donald. He took the criticism well, stayed professional and didn’t disagree. The WR allowed his competitive instinct take over and scored a 29 on his Argentine Tango, missing that final 10 from Len. The previous Argentine Tango that Driver/Murgatroyd showcased was in Week 5 which left the couple with a total of 27 of 30 points. The same score as Week 4 and for what would be repeated during the three ensuing weeks. Donald’s final Argentine Tango of the season tonight showcased lifts and quick-paced steps similar to previous installments but with enhanced and more detailed choreography for the finals per Inaba, but it wasn’t enough for a perfect score. “The finals are here, you have to peak at the right time,” said Driver. It looks like the duo of Driver and Murgatroyd is continuing to peak the more they dance. One more dance is slotted for tomorrow’s finale. Will Driver continue to peak? It’s often the job of football officials to make the final call but this contest involves no instant replay or overtime. It will be left up to the millions of voting fans and the three judges. Help be a judge. Viewers can vote via phone at 1-800-868-3403 until 10 a.m. CT. Log on to abc.com to learn all the ways fans are encouraged to vote. 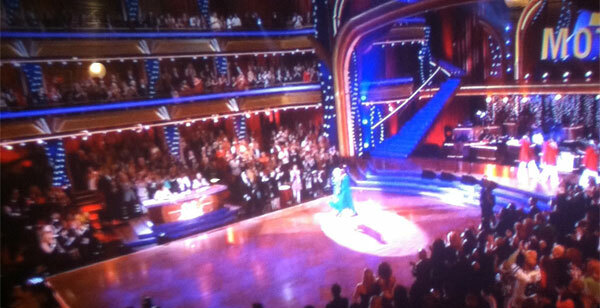 Donald Driver will dance “Freestyle” and the Argentine Tango tonight at 7 p.m. CT on ABC in the finals. He and partner Peta Murgatroyd have already showcased these dances as a couple on “Dancing with the Stars”: Cha-Cha-Cha, Quickstep, Rumba, Paso Doble, Argentine Tango, Foxtrot, Viennese Waltz, Tango, Waltz and Samba. That’s 10 variations, not counting group dances, or dance elimination challenges. Of the twelve dances already completed, Driver and Murgatroyd’s weekly average individual score is the lowest of the three finalist couples at 26.4, a fraction behind second-place duo Levy and Burke at 26.9. Jenkins and Ballas, despite last week’s dip in score, are still the reigning individual point leaders with a 27.3 average of a possible 30 points. As soon as Tuesday night’s tailgate party ended in La Crosse, the players filed back onto the tour bus to watch the final minutes of “Dancing With The Stars.” There was a collective sigh of relief when the results were announced and the players realized Driver was moving onto the finals. 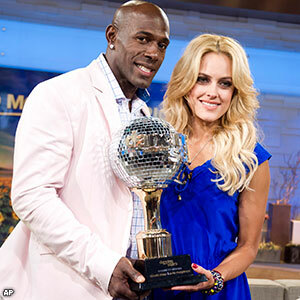 WR Donald Driver and partner Peta Murgatroyd continued their uphill journey towards the mirror ball trophy and reached their highest single dancing score of the season with a total of 29 points, beating their score of 28 from last week’s Jive. This high score came about on the couple’s second of two dances for the night, the Samba. Combined with their first dance score, 28 points for the Waltz, the duo received a total of 57 of 60 possible points, leaving them in third place for the evening. The judges used their experienced eyes to critique the smallest misstep for all contestants during this semifinal round. Judges being stingy with the 10’s was nothing new for Driver. He took the first round of judging in stride with one “10” from Judge Bruno Tonioli. Prior to their second dance, each semifinalist reflected back on their diverse and emotionally-charged background. Driver’s story began with his father being in jail and his mother raising five kids alone, with little resources. First living in a moving van and eventually homeless, Driver and one brother went to live with their Grandparents in a rough, crime-ridden neighborhood. “I stayed a troubled kid,” said Driver. The turning point was when he met his future wife. From that moment, Driver focused less on his past antics and focused more on his future. He focused on the future for his family by developing his football skills, and that’s what brought him here today. After the emotional rewind, Driver moved forward and delivered a solid Samba and received his first two “10 point” scores from Judges Carrie Ann Inaba and Tonioli. Perhaps the “good luck charms” in the audience helped Driver attain his highest score in the 9 weeks of competition. Along with Aaron Rodgers, audience co-workers included Coaches Mike McCarthy and Edgar Bennett, Director of Player Development, Rob Davis, and LB Clay Matthews. With four couples remaining in the semifinal showdown, Driver and Murgatroyd delivered their best dance of the season when they needed it most. Hopefully this upward scoring trend will continue for next week’s finale. For now, Packers fans across the nation can breathe a sigh of relief for their favorite dancer on “Dancing with the Stars,” but only for a moment as Driver needs fan votes to ensure he and Murgatroyd remain in the competition. Eliminations continue tomorrow night on DWTS. To keep Donald and Peta in the finals, viewers are encouraged to vote. Visit abc.com for all the ways to vote. Dancing first this week on “Dancing with the Stars,” the duo of Packers WR Donald Driver and Peta Murgatroyd delivered the tango without apology, scoring 27 out of 30 points, the same score for the fifth straight week. Similar to the couple’s first successful tango weeks earlier, the couple again seemed to gratify all three judges. “Ding dong Donald, a first round knockout,” said Judge Len Goodman. Judge Carrie Ann Inaba was the first to give Donald and Peta a perfect 10 for their tango a few weeks ago, but only offered 9 points for this week’s version (along with the other two judges). Inaba also served a side of criticism, hoping for a little more “drama” with their dance. The Tango was the first of two dances team “Driving Miss Peta” completed on Monday’s Week 8 episode. All six remaining dancing pairs were slotted to complete a “Trio Dance” which involved each ‘star’ dancing with both their typical counterpart and an additional practiced cast member. Driver’s Trio included that of professional dancer and “DWTS” regular, Karina Smirnoff, along with his usual partner, Murgatroyd. The Driver/Smirnoff/Murgatroyd trio successfully completed their version of the Jive, which featured high-energy moves and quick-paced music. Judge Inaba provided a much-needed 10 points for the trio while the other judges provided collective 9’s for their second performance of the night, bringing Driver’s total to 55 points. “Double” must be the theme for this week’s show as double partners, double dances and this week’s contest features a “double elimination” on Tuesday, taking the pool of six couples down to a mere four. Based on scoring alone, it seems the “Double” theme is working for Double D. Will he get through with his dancing scores and the votes needed to bring him to the next level? Eliminations continue on “Dancing with the Stars.” Viewers are encouraged to vote via phone and text message for Donald only on the night he performs; online voting ends at 10 a.m. CT the following day. Log on to abc.com to vote. Likely unsurprising to Packers fans, Donald easily kept rhythm with his swift and agile footwork during the Viennese Waltz and received a post-dance standing ovation from the full audience in the ABC ballroom. Costumed like true royalty, the pair received praise from the judges and modest critique along with 9 points from each. Len Goodman who has judged Driver both hot and cold in previous weeks told the couple they did a great job and that their dance was well done. “I thought it was terrific,” said Judge Len Goodman. This 7th week of competition provided Driver with the probable security that he will see Week 8. But will it be enough for this royal duo? The fast-paced Foxtrot proved to be the right pace for WR Donald Driver and Peta Murgatroyd, scoring 27 out of 30 total points for the third consecutive week. Last week, Judge Len Goodman provided Donald with his low score of the week, 7 points. Goodman complimented the team this week and provided them a score of 9 points along with the other two judges. During their post-dance interview with Brooke Burke, the couple congratulated each other accordingly. Eliminations continue on “Dancing with the Stars.” Viewers can vote via phone and text message for Donald only on the night he performs; online voting ends at 10 a.m. CT the following day. Log on to abc.com to vote. Three weeks into his stint on “Dancing with the Stars,” Packers WR Donald Driver’s progression as a dancer is mirroring that of his football career. Driver has steadily improved his score each week, going from 21 in week 1, to 24 in week 2, and 26 in Monday night’s show. And what did each judge think of the pair’s execution? Judge Bruno Tonioli rounded out the scorecard, telling Driver, “You push yourself to the limit every time.” Tonioli awarded the Packers’ all-time leading receiver with a 9. Driver and Murgatroyd’s 26 was the 4th-highest score of the evening.